Highlighting the risk and harm associated with fake products to consumers is a good place to start. The criminal networks producing counterfeit goods don’t care for the consequences behind their fake products or indeed the harm they could cause to members of the public. You may question how buying a fake product could hurt anyone. But with reports on social media and in the press of injuries from fake electrical goods and beauty products, getting those messages out has become a matter of public safety. In a report soon to be published by the IPO, make-up features in the top five most counterfeited products investigated by Trading Standards. These fake cosmetics have been produced to look like premium products. However, these poor substitutes often contain high levels of chemicals that can cause nasty injuries to those using them. These products are often targeted at young people who want to have the latest celebrity look. With this knowledge do you think that consumers would intentionally put themselves at risk? And will it make them question their purchase? In response, the IPO has launched a series of awareness campaigns to highlight these risks, along with the often-hidden consequences of the counterfeit marketplace. 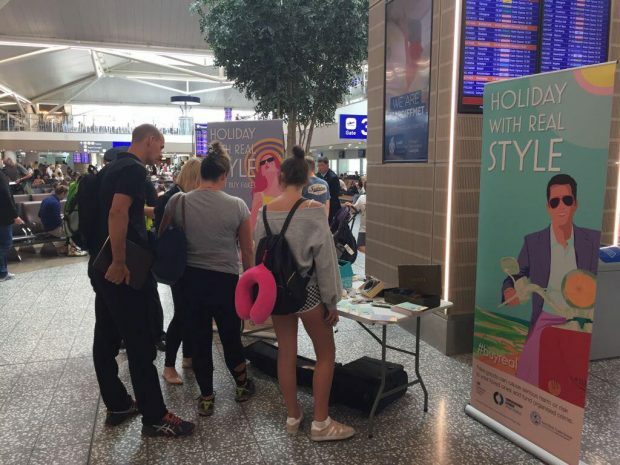 In August, we revived a campaign targeted at holiday goers, working with police and airport staff. Over the last 12 months, we have visited international and local airports across the whole of the UK to highlight these messages. 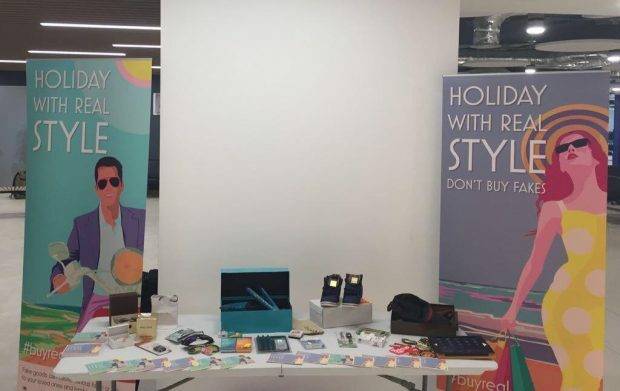 This week, we spent time in Bristol and Cardiff speaking to passengers and staff with a selection of fake products from a wide range of brands. In a short poll carried out at the airports with passengers and staff, 78% said that they would not knowingly buy fakes, but had been tempted by low prices and availability of these products, especially when on holiday. When asked what would stop them from buying fake goods, 70% said that the potential harm these products could cause would stop them from purchasing them. So, as we leave work and stress behind us to embark on our holidays, we may easily be tempted to buy fakes when abroad. But wherever you are, these inferior products can still cause harm and fund organised crime from their proceeds. At Cardiff Airport showing a selection of fake goods. We are asking the public to get behind the #buyreal campaign during August and throughout the year. We will be raising awareness and fighting against fakes by highlighting not only the harm that they can cause, but the detriment they can cause to you as a consumer or your loved ones. For advice on how to avoid buying counterfeits, go to our IP Crime and Enforcement consumer pages for top tips. 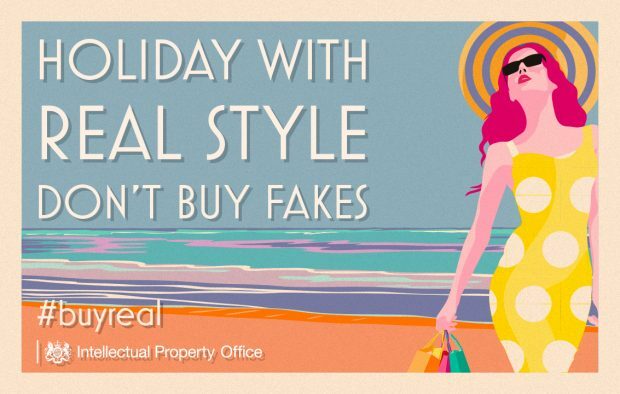 Stay safe this summer, holiday with real style and don’t buy fakes! Cool and colourful indeed! Really loving the retro art deco look too, it takes us into a colourful and cool direction. Make the font slightly heavier and drop the drop shadow too. Thanks George, glad you like them! Nice posters! Were they created specially for the campaign? Thank you. Yes, they were created for this campaign by our talented in-house design team.